I know I keep talking about this, but my kiddo tends to be a picky eater (unless it’s something sweet… she’ll eat all the candy… but that’s not really food). This picky eating means I need to get creative. Even though I know it’s a little extra work, my kiddo loves it and it makes me happy to see her smile. Win/win/she eats her veggies. 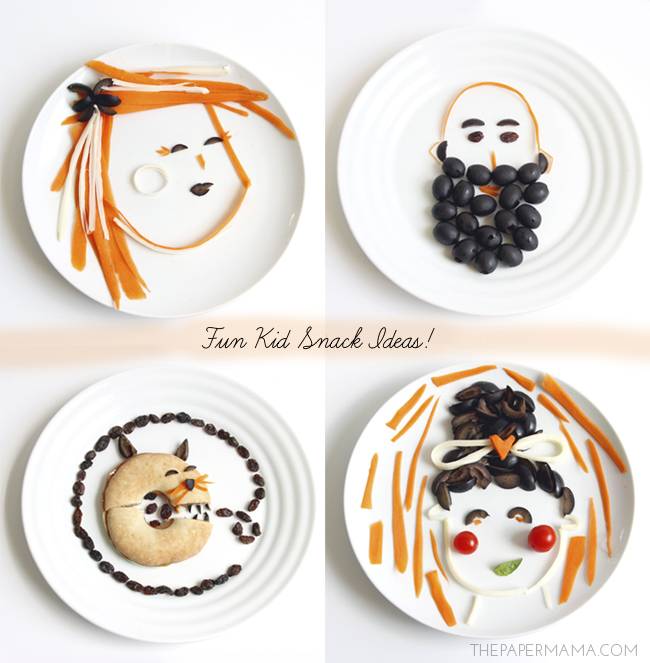 That’s why I’m sharing these fun kid snack ideas today. I know my kid can’t be the only picky eater. In July, I made a few faces for the kid’s dinner and now she pretty much requests a face for dinner/snack time almost everyday, so it’s definitely a special treat whenever I make these for her (since I don’t make them everyday). They’re not a ton of work, but I like randomly surprising her with these little bits of food art. I use strips of carrots and black olives for almost every food creation. 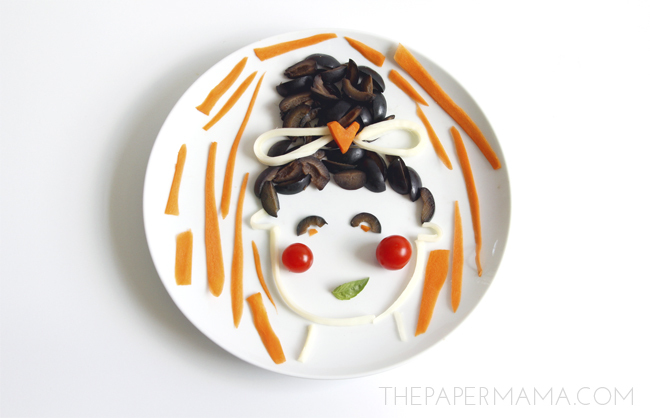 The carrots are PERFECT for hair and face shapes, and the olives work for hair/eyes/noses/everything. 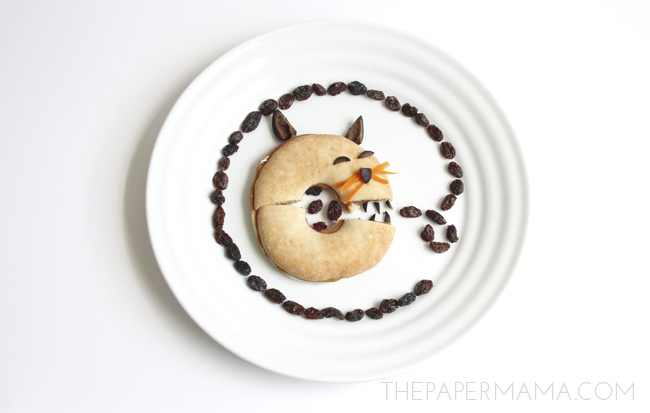 If you’d like to make one of my cute snacks, check out what I used and how I made them below. To make this lady you’ll need a peeled carrot, peeled string cheese, and 2 California Black Ripe Olives. Make a “corner” of carrot hair. Just pile it on. Use two carrot strips to shape the face. Add the peeled string cheese over the hair and around the face, then use a circle of string cheese for the cheek. Cut a black olive into 6 pieces and arrange on the “corner” of carrot hair to make a little hair bow. Cut out 5 segments from the second black olive. Use two for the eyes and three for the mouth. The eyelashes and nose are made from little carrot pieces. For this meal you’ll need: raisins, 2 California Black Ripe Olives, a baby carrot, and a bagel sandwich (this is a peanut butter/honey sandwich). Make your bagel sandwich and cut it in half. Place in the center of the plate and make the bagel open it’s “mouth”. Cut 2 large triangles, 1 small triangle, 5 tiny triangles, and two semicircle segments out of the black olives. Arrange the eyes, ears, nose, and teeth with the black olives. Peel 6 pieces off of the baby carrot and arrange as whiskers. Toss a couple of raisins in the center of the bagel (those raisins are in the monster kitties belly) and arrange the raisins around the plate. For this snack you’ll need a half a can of California Black Ripe Olives, 2 raisins, and a couple strips of peeled carrot. 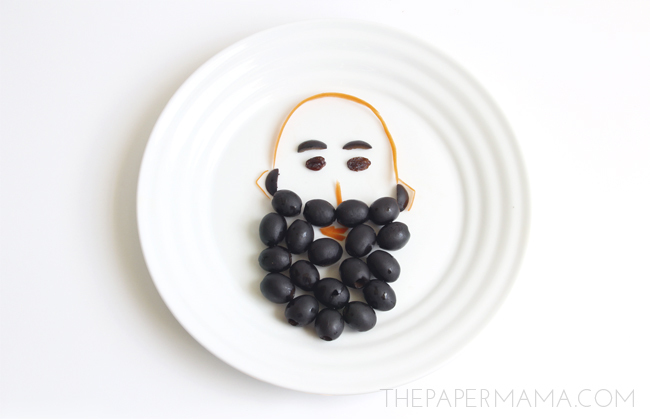 First, arrange the beard using all but one of the black olives (be sure to leave a space for the mouth). Cut one black olive into 4 slices. Use these slices for the sideburns and eyebrows. The two raisins are eyes. Use one long strip of carrot to make a bald head, three small pieces for the mouth, one strip for the nose, and two small folded pieces for the ears. For this snack you’ll need a half a can of California Black Ripe Olives, one carrot, one small basil leaf, two small cherry tomatoes, and string cheese. Cut the half can of black olives into quarters. Arrange these olives as the hair to make a bun. Peel the string cheese and make the face, ears, neck, and hair bow. Two small black olive pieces make up the eyes, with little dots of carrots for the pupils. Place the cherry tomatoes as cheeks, and the mouth will be an angled basil leaf. Cut a small section of carrot into a heart shape and place in the center of the cheese bow. 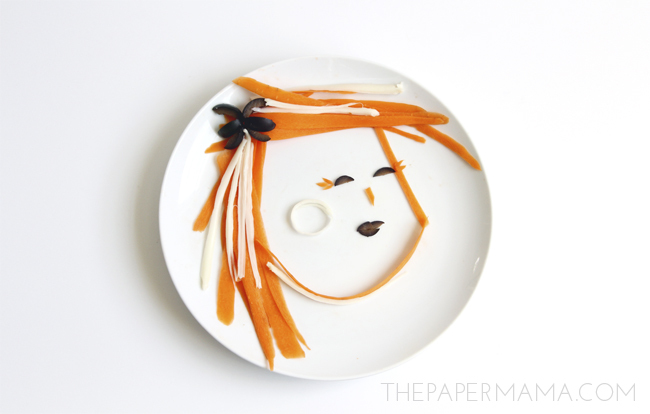 Peel the carrot and place the strips around the face for the “background” of the food art. You don’t have to use the exact ingredients I used, get creative! Explore this hashtag, #CalOliveCrafts, on twitter/facebook/pinterest to get some more food art inspiration. Happy snacking! Follow California Ripe Olives on Facebook to enter their Back to School Sweepstakes! Visit the custom tab, and enter once per day for the chance to win an Amazon Kindle Fire HDX. Sweepstakes runs August 18 – September 12, 2014.